It wasn't so obvious for Faith as she took quite a while to establish a master hand. Even up to now, we are only 95% sure, simply based on the fact that she uses the right hand to hold the pen. So why only 95% sure? Well, I see the way she hold the pen to write and draw is quite wobbly and so perhaps she has unwittingly been using the non-master hand? Hence, I reserve the 5% to anticipate that one day should she decide to switch to the left. er.. my niece use right hand... then she injured her finger... then she started using left hand... now she sometimes use right and sometimes left hand... We dun know she right or left handed.. whahahaha! why pixelled your face?? lol..
Aloe: Well for me, I am a lefty but I play golf and pool right handed. I used to be able to use chopstick with both hands. Now right hand long time neber practice, rusty liao. Spinnee: Hence my final reservation of 5% that she may switch to the eventually master hand later in time. HiaoAunty: Faith is 4 now and again like I said to Spinnee above, there is still the 5% chance that she may switch. Sunflower: I didn't say right is bad but just wonder if any of my lefty genes were passed down. That's all. Jaschocolate: Dunno leh... all the brushes available that day all that size leh. KingMeng: Brush not I give one lah.... 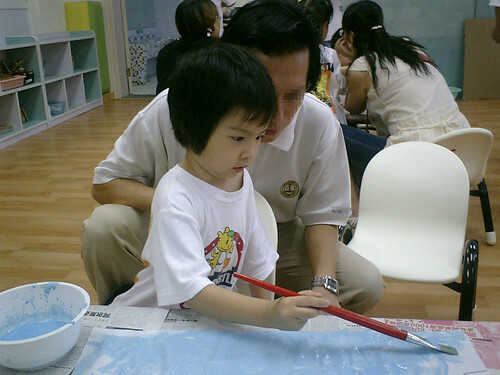 The school provided the brush for art class lah. You also damn tuut lah you. Pencil how to do painting? Okie let me put the record straight. Children at 4 years of age are not supposed to be holding pencils to write. Fat paint brushes are the correct "instruments" at Faith's age. Just look at the way Faith gripped the paintbrush, she is holding it beautifully as in like holding a pencil (some children of 4 years cannot). It is interesting to note that she is painting the entire paper blue (would had been good if i could ask her to interpret that... sea? sky? or draw something with that paintbrush). I studied Language and Art so therefore I know such stuff. HiaoAunty: She was painting the sky actually. Then again, that was all she could paint since there was only blue in the palette. I write, eat as a lefty. I cannot use mouse on my left hand, play pool and badminton with my right. Barffie: For me is everything left except, golf, snooker/pool and mouse.